I spent a summer in a small Mississippi town and can attest that the depiction of life in this new novel is spot on. Everyone knows everyone and secrets aren’t that way for very long. Since I grew up in a big city and have never been far from one since, I can’t see myself ever moving to a small town, but I’m thankful for books like this that bring alive a special slice of American life. This novel is a quiet magical story that is set in the South and what a great name for the protagonist: Genuine Sweet. She narrates the story and her voice springs from the pages. A first crush, dealing with a father who drinks too much, and a gift for granting wishes to others, Genuine has a heart for making things right. It’s a tough job that she faces head on, unafraid to speak her mind. One of the strongest female characters in MG the past year. Perfect for out loud reading, girls will navigate to this one more than boys. I’m glad I took the chance and hope for a sequel. FULL PLOT (From Amazon): Twelve-year-old Genuine Sweet, of tiny Sass, Georgia, can grant any wish . . . except her own. It’s a peculiar predicament, considering how much she could use a few wishes. New friends help Genuine give her family a boost–and then she takes her gift global! Life finally seems to be on the mend. But when she’s faced with unexpected trouble that no amount of wishing can fix, Genuine must puzzle out the difference between wishing for a better life and building one. Anyone who becomes a wish fetcher discovers a unique way to grant the wish. For Genuine, her recipients taste one of her homemade biscuits made from magical flour. I got hungry very quick, and the next time I’m eating a biscuit, I may make my own wish. Genuine’s friend, Travis, is a handful. We discover why as the story progresses. The change we see in him is heartwarming. The author expertly defined the town of Sass, Georgia. I felt like I was walking down the main street. Superb world building. Heavy adult themes of death, alcoholism, and cancer are handled well. I’d have no problem with a fourth grader reading this book. If you enjoy books like A Snicker of Magic, Savvy, or A Tangle of Knots, then park yourself and enjoy this debut. FAVORITE LINE: Right then, I found myself thinking of what Gram had said about wish fetchers being the underlings of angels. 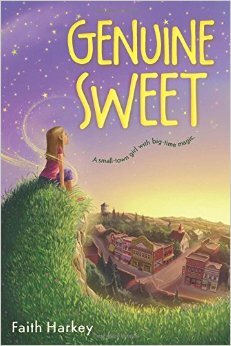 This entry was posted in Reviews and tagged Faith Harkey, Genuine Sweet, Marvelous Middle Grade Monday, MG book reviews, Middle grade. Bookmark the permalink. First of all the cover is eye-catching. I grew up in a city and neighborhood like this. It does sound magical. I am sure I would love this book just from reading your well-written review! I also loved some of the other books you mentioned like Snicker of Magic. I spent a lot of time in small towns and always enjoy reading stories set in them. This sounds like a genuinely sweet book. (Sorry. I couldn’t help myself.) Thanks for telling me about it. I will keep an eye open for it. Cute cover and nice review! Between the huge amount of sadness and the Southern setting, I didn’t take to this one well. That’s why there are lots of different books for different readers! I really enjoyed your author’s quote as she had all the same favorites as I did growing up. This sounds delightful! I’ve only been as far south as Virginia, but I love reading about the South (seems so exotic to me). I also love the character’s name and the magical elements. I’m intrigued by the magical element in this story. Just the premise gets me wondering! I first heard about this book not too long ago. I’m a big fan of Savvy and A Snicker of Magic (and your summary reminded me of those books before I saw #5). Glad to hear the heavy adult themes are well-handled. I’ve had this one on my TBR list for a while, but now it has been bumped up a few places. Thanks for the review!